Market Street has long been one of the most dangerous streets for cyclists in San Francisco. With over 150 collisions in just the last two years, it has become a war zone for bicyclists, pedestrians, and automobiles all trying to carve out a spot for themselves. Crash data shows that Market Street is home to four of the most dangerous intersections for pedestrians and two of the most dangerous intersections for cyclists in all of San Francisco. I see the terrible results of this close-quarters combat every day as a bicycle accident attorney in San Francisco. I know how devastating even a seemingly minor injury can be and I know it’s time for a change in San Francisco. Thankfully, so do city planners. San Francisco has identified Market Street as a top priority under the new Vision Zero commitment. Several planned improvements have been fast-tracked with some in place already. However, critics say the proof that these changes will actually make a difference for cyclists and pedestrians remains to be seen. All of these changes will be implemented in stages (the raised bike lanes are already in place along a two-block stretch and turn restrictions began in August of 2015). The SFPD will be enforcing the new rules through increased presence and aggressive ticketing. This multi-organization plan would essentially rebuild the street between Octavia Boulevard through to the Embarcadero. This community-backed initiative will create anchor neighborhoods, reinvigorate open spaces, and link public venues like the City’s Civic Center with other cultural icons within the target zone. Five separate city agencies are working with several private organizations and asking for public input to make these changes happen. This coalition seeks to create a street that is oriented toward pedestrians, cyclists, and public transportation rather than private automobile traffic. While their motivation is largely financial, proposed changes would make that stretch of Market Street safer for everyone. While victims and advocacy groups have been calling for change along Market for years, many aren’t completely sold on these projects. They say that raised bike lanes may prove to be a hazard for inexperienced cyclists and that official loading zones aren’t enough to stop delivery vehicles, taxis, and municipal busses from putting the squeeze on cyclists. And what about the adverse effects of the changes on drivers? Sf Gate recently reported that the new traffic patterns were met with significant resistance from drivers who “want to do what they want to do.” A handful of Parking Control Officers even had to physically bar turning traffic by stepping into the street. Justin Scales, who was struck while riding and left with a steel rod in his leg, told the media outlet that he doubted the changes would really make a difference for cyclists. “I don’t know that there’s any solution other than putting up metal rails to protect the bike lanes,” he said. It’s clear our city’s infrastructure is facing problems as bicycle ridership increases alongside automobile traffic. And no one-size solution has presented itself. However, as a San Francisco personal injury attorney I’m happy to see that San Francisco is finally taking action to make our streets safer for cyclists. While plans like the redesign of Market Street and the implementation of somewhat controversial traffic changes have yet to be proven, at least they represent steps in the right direction. 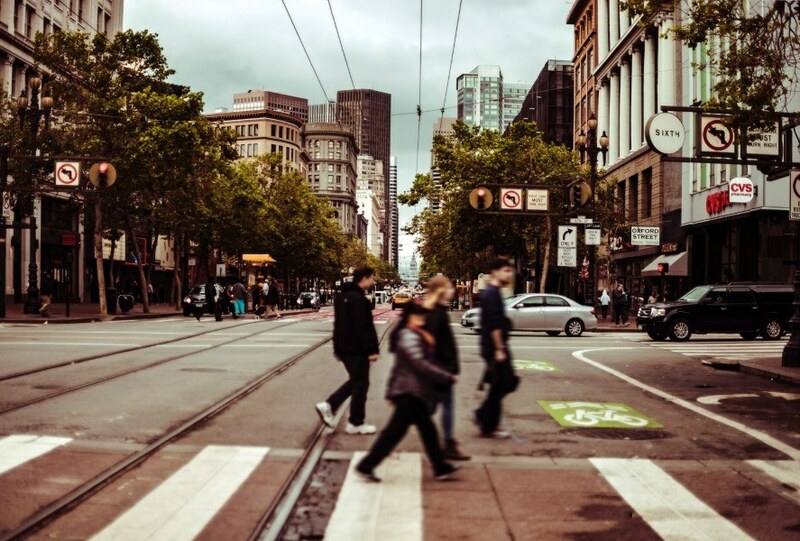 If you need an experienced San Francisco pedestrian accident attorney, get a FREE pedestrian case evaluation online now. We are here to help!